After our wet summit lunch we decided to head in the general direction of Loch na Lairige, following a good path to start with, then losing it in hummocky ground……..
We came below cloud level and were pleased to see our cars, but they were a long way below us! 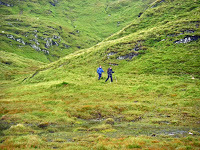 The descent was steep grass, well off the beaten track. We crossed the electrified fence again, it puzzled us; as there was no forestry plantation to protect. 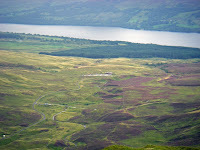 It turns out that when the NTS purchased Meall nan Tarmachan in 1996 they had plans to establish an enclosure within 5.5 kilometres of electric fence at Creag an Lochain; to restore montane willow scrub. 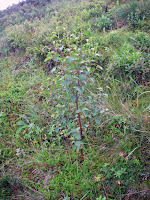 As a result of excluding grazing animals the whole hillside is rich in plantlife. We easily recognised Meadowsweet (Filipendula ulmaria). 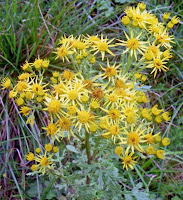 Stinking Billy, or Common Ragwort (Senecio Jacobaea) is normally found in grasslands, roadside verges and fields. 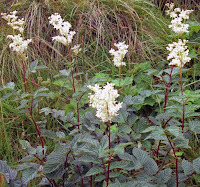 It is an attractive plant but is highly poisonous to livestock. It has been subject to a recent Act of Parliament. The name Stinking Billy has nothing to do with our Bill but is linked to a famous battle in Scottish history. After the Battle of Culloden in 1746 the victorious English are said to have renamed the attractive garden flower Sweet William, in honour of their leader, William, Duke of Cumberland. The defeated Scots retaliated by naming the obnoxious weed Common Ragwort - Stinking Billy. 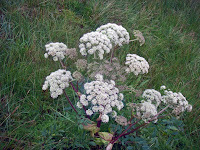 Wild Angelica (Angelica sylvestris) was an unexpected find on a Scottish mountainside. The vegetation was lush; removing grazing pressure on the plants allows strong growth. 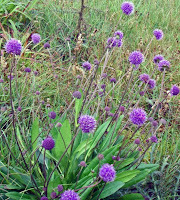 Devil’s Bit Scabious (Succisa pratensis) was instantly recognisable, but it’s size made us doubt it! The NTS have also been planting birch, downy willow and other species in the enclosure, it may take another 50 years to realise their exciting vision of extensively restored montane willow scrub. 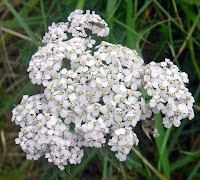 Yarrow (Achillea millefolium) was difficult to identify, we just don’t expect to find such plants on the hill! It was a short day out, the unexpected Flora being the day’s highlight. 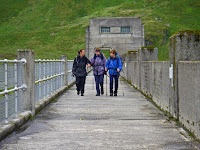 On the walk back to our cars the girls were still deep in discussion….…..they had been since we started out…… .